by Brianna Crandall — November 12, 2018 — Water delivery company Elkay just announced the launch of its innovative new beverage dispenser: Elkay Smartwell — and it’s not your father’s water cooler. Smartwell is a fully integrated, intelligent system offering fresh, filtered water through Elkay’s WaterSentry filter that is NSF/ANSI 42 and 53 certified. Smartwell offers still or sparkling water with options for a variety of flavors (lemon, peach, pomegranate, cucumber, coconut and more) and nutritional plus-ups (electrolytes and vitamins), plus a natural sweetener. 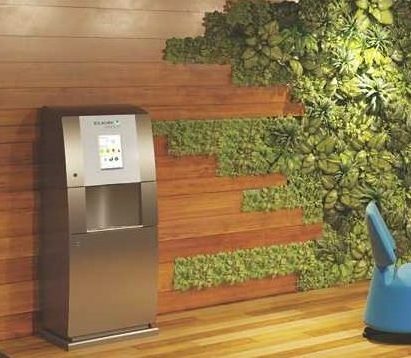 Designed specifically with offices, boutiques, auto dealerships, hotels and other group spaces in mind, Smartwell gives users the option to create their own custom beverages on demand — while promoting healthier choices, cost savings and environmental sustainability. Smart refill technology and full internet connectivity, meaning facilities managers (FMs) and office administrators can monitor usage and other metrics remotely, while Elkay’s dedicated team of service professionals can track when flavors are running low and adjust accordingly. H2O customization options, including the ability to choose several different flavor varieties and add vitamins, electrolytes, vitamin C and caffeine for “limitless” combinations. Fresh, filtered water: Smartwell features WaterSentry filters that are NSF/ANSI 42 and 53 certified for reduction of lead, class 1 particulates and chlorine, while improving taste. Healthy hydration, to promote user health and wellbeing while providing an alternative to high-calorie, sugary beverages. All fruit flavors and enhancements are gluten-free. Environmentally-conscious dispensing: multi-use pouches dramatically reduce waste buildup in lieu of single-use plastic bottles and aluminum cans. Smartwell is designed to save customers money (no need for pricy canned/bottled drinks), promote environmental sustainability (less plastic waste in oceans and landfills) and encourage health and well-being (no more sugary drinks). It’s a smart, comprehensive beverage solution that’s changing the game for today’s office administrators, FMs and sustainability professionals. Smartwell is currently available in Chicago and New York City, with plans to expand to new markets in 2019. Find out more on the Elkay website.